Posted on December 5, 2014 - 12:00 AM by Thomas J. Real Estate Inc.
Thomas J Real Estate Inc sells another home! Thomas J Real Estate Inc sells another home. 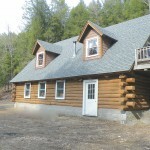 This 2 bedroom, 1 bath log home located at 208 Hope Falls Rd Hope, NY was recently sold by Thomas J. Real Estate, Inc. According to Thomas J. McGroder, Broker & Owner of Thomas J. Real Estate this log home was built in 2006 by a local resident & the white pine logs were cut and milled just down road. In April 2014 the owners decided to list the home for sale and had discussed their options with Thomas J. At this time the home was not finished and needed additional. Including completing the kitchen, bathroom and heating system. The home has good bones and rests on a concrete slab. A drilled well, septic system and electric were already installed. In December 2014, a buyer was found and a final price was negotiated. On March 23, 2014 the closing took place and the sellers transferred title. Thomas J. Real Estate, Inc. has 2 offices. Our main office is located at 78 Northville Rd Edinburg, NY and our branch office is located at 3 Lent Drive Highland Mills, NY. Our Edinburg office works mainly with buyers and sellers in the Capital Region and along the shores of the Great Sacandaga Lake. Our Highland Mills office also works with buyers from the New York City Metro Area.